Rules: At the start of your turn, you may destroy this item. If you do, reveal the top card of your deck. 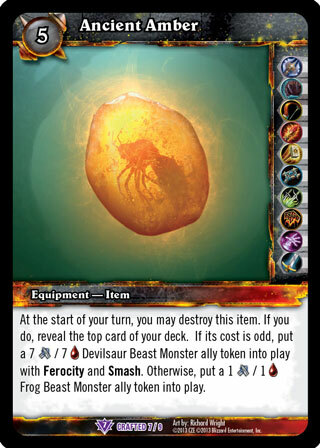 If its cost is odd, put a 7 [MELEE] / 7 [HEALTH] Devilsaur Beast Monster ally token into play with Ferocity and Smash. Otherwise, put a 1 [MELEE] / 1 [HEALTH] Frog Beast Monster ally token into play.